A Malaysian in France: Salt desert! On tonight's Pekin Express (similar to Amazing Race in US), the contestants were asked to cross the salt desert by foot. A desert full of salt!!! This is the first I heard of it and it is simply impressive and stunning. It used to be salt lake. 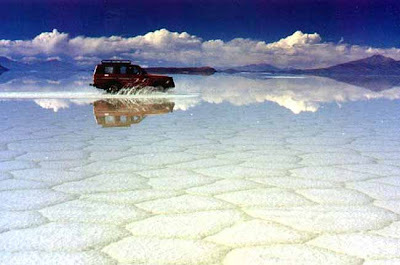 It is located in Bolivia, a place called Salar de Uyuni. I'm not sure I could cross this desert by foot though. I saw that too, it looked amazing! I've put it on my (already very) long list of places I want to visit. wah...looks very nice. But surely it's very hot (desert) and bad for the feet (salt)...and it's so far. =_= Bolivia is in S.America right? First time to heard about the desert full of salt ? how can that be ? World really big and alot of different things happen..